Do you know when Father's Day is this year? JUNE 17! That's coming up quick which makes this the right time to start thinking about what to get the father-figure in your life. In the paracord world, I'm all about making the DIY gift ideas for dad. The gun slings, the survival/tactical bracelets, fishing accessories ...really anything for the outdoors is a go-to for my dad. But sometimes that just doesn't work out. 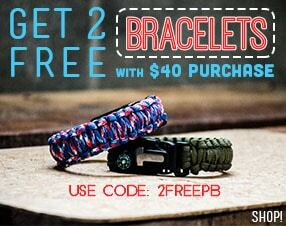 Fortunately, there are awesome paracord gift ideas that are already put together! So the question is what can I get and/or make for my dad that I haven't yet, more importantly, what will he actually use? The only way someone hasn't heard about a Yeti Cup, RTIC Cup, or the like is if they live under a rock. They're everywhere! And for good reason, they really do keep your drink hot or cold longer than any other cup I've ever had. The downfall of these cups for some is they don't come with a handle. But that's fine by me because I can make myself AND my dad (who just got one) personalized cup handles. To make it, they're really very simple. All you need is some Para-Max for the handle (you can use 550 too, but I prefer the thicker cord) and 550 Paracord for the handle. Measure the Para-Max aganst your cup and then weld the ends together forming a really big loop. Then start with your 550 paracord and do the Cobra/Solomon, making sure to keep pushing it up so that you make the loops for the cup as tight as you can. That's it! Bingo you just made your own matching Yeti Cup Handles for you and your dad! If you have a dad that's into tech then this one is for you! I bet he has a smart watch, which means he needs a smart watch band. What could be smarter than a Paracord Apple Watch Band?! The best part is you can either make one yourself with whatever weave you want or shop our pre-made ones. If your dad is like mine, he wouldn't even know what a smart watch is. My dad spends most of his free time outside building stuff, fixing stuff, or relaxing. Which means he needs a durable watch. A paracord watch is strong, durable, and can withstand the elements of whatever he puts it through. It can be taken apart with a little effort and the paracord, as we all know, can be used in a ton of emergency situations. Have a watch face already picked out? 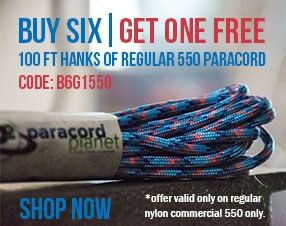 Make your own band with 550 paracord! If your dad is into adventures, hunting/fishing trips, or a prepper a Tactical Rope Dispenser is right up his alley. While it's not something that you can make, it's a great tactical item for them to keep in their bag for emergencies. No need to disassemble a bracelet, it's already in a handy container that he can just un-spool however much he needs and then cut it seamlessly on the blade. For more ideas, see 2016's blog on What to Get the Hard-to-shop-for Dad.